cyber security policies, tailored to your business. This training complies with the requirements of GDPR. 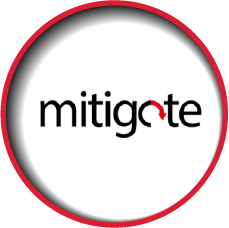 Mitigate is the most cost-effective way to support and train your personnel in cyber vigilance. These GCHQ approved and certified, on-line courses provide the right skills and confidence to achieve “Cyber Trusted Status”. Access an easy-to-use and engaging e-learning model to train all employees. Manage and audit employees to maximise the results, record progress and motivate learners. Institute a suite of clear, strong policies on various aspects of cyber security. 1.Online Security Training: Providing the learner with basic tools to ensure all internet usage is safe, knowing how to keep email communications secure and be alerted of the potential risks and share little-known techniques to create truly protected passwords for your various devices and accounts. 2.Remote Security Training: Providing the learner with the risks associated with remote devices. Focused on personal equipment, company-provided equipment and how they both interact with any public Wi-Fi network or other networks that could host potential vulnerabilities for the user. 3.Information Security Training: Providing the learner with the intermediate skills to manage data and information, through a knowledge of the various levels of data classification and the respective levels of risk and responsibility surrounding them, as well as how to encrypt and back up data, to mitigate against attacks or human error. 4.Workstation Security Training: Providing the learner with advanced skills to spot potential physical vulnerabilities in their own cyber security at work. This includes an understanding of how to recognise, destroy and dispose of threats to confidential information and how to increase vigilance to the threat of attack through social engineering. "Data security is not only a fundamental aim of the GDPR, but without competent systems and personnel, the efficiency of your business, your reputation and your revenue is at stake. A wake up call is on the horizon, with the introduction of the GDPR, which comes into force in May, 2018. This brings a number of stringent requirements to businesses, including staff training, notification of breaches to the Regulator, further notification to those affected, including customers and the likelihood of being fined up to 4% of total worldwide annual turnover (revenue) for failing to comply with the requirements of GDPR.Consequently, it is important that any organisation that collects, processes or stores personal data is aware of the changes that will occur and is fully prepared and compliant before then.